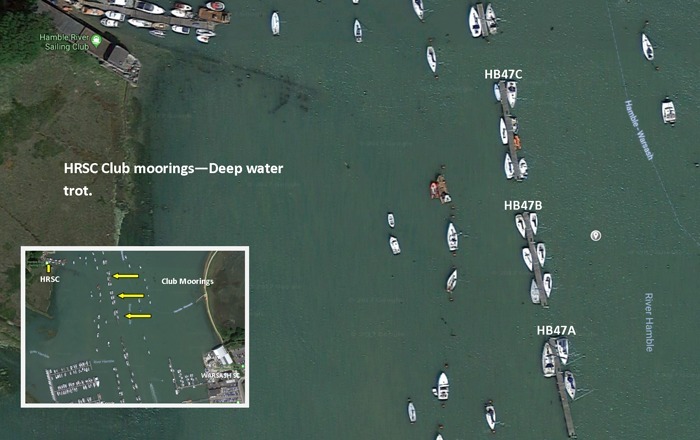 Hamble River Sailing Club has a number of moorings; the majority of which are in deep water, and can accommodate boats up to 12 metres in length. We have an up-river pontoon, 85 metres in length and in deep water. This is competitively priced, and very popular; hence there is usually a waiting list for berths here. Down river and opposite the club we have recently installed 3 x 33m pontoons to replace the previous fore and aft mooring trot. This safer and more desirable arrangement gives us the flexibility to offer moorings to all classes of cruiser in relatively deep water. Up river we have a line of 5 moorings located on the edge of the deep water channel on the Warsash side and in a sheltered location. These are ideally suited to boats under 8 metres with shallow draught boats, as the minimum depth can be below a metre. 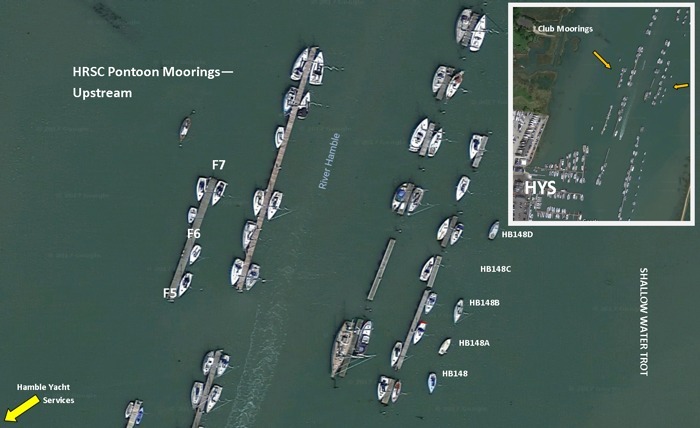 Moorings are allocated to club members and on an annual basis. It is a condition that mooring holders either race with us on Wednesday evenings or volunteer to assist with various roles in the running of some of our sailing events, such as the Warming Pan, Firefly or other dinghy open meetings, and/or the Garmin Hamble Winter Series. It is the ethos of Hamble River Sailing Club that members support the club and it's events rather than just use its facilities without givng in return. However on occasions, if there are vacancies, the club will consider an annual mooring agreement to meet club members needs.